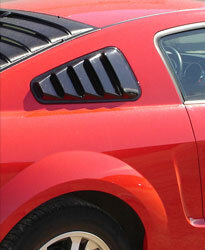 Personalize your Mustang, Challenger or the new Camaro with Astra/Hammond Side Window Louvers. On their own, or matched with our Rear Window Louver (sold separately), these Side Window Louvers increase your vehicle’s privacy and help minimize your vehicle’s interior temperature. These classic, custom-fitted, C-Pillar Louvers are thermoformed from a durable black “ABS” material and are easily installed – no drilling required – simply by placing over the existing glass with the supplied 3M doubled sided automotive-grade tape; they have a ready-to-paint surface that can be ordered to match your vehicle’s color and painted using our Paint Program. All our products are manufactured to ensure the customer satisfaction of quality products with styling designed for fit and finish second to none.